The River Welland at Deeping St James roadside looked to be in good trim for the Deeping Several Fisheries Cup match on Sunday, but a bitterly cold wind and the previous night’s frost led to a difficult day for some. 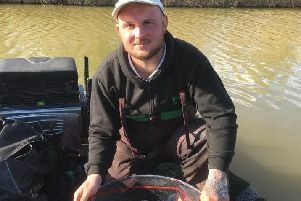 Top rod and Several Fisheries Cup winner was Ivan Marriott with 8lb 14oz from peg eight. He caught over 100 fish on bread punch. Runner-up was Paul Dotchin (7lb 7oz) and third Alan Jopling (5lb 2oz). Whittlesey AA, Whittlesey Dyke: 1 John Taylor 4lb 5oz; 2 Andy Bull 2lb 6oz; Mark Barron 2lb. Over 55s, Six Island Pool, Decoy Lakes: 1 Tom Wilson 122lb 8oz; 2 Bob McBeath 88lb; 3 Stan Dow on 85lb 4oz. Float Fish Farm Fishery, Wednesday Open: 1 Dave Marzell 39lb 9oz; 2 Tom Wilson 38lb 8oz; 3 Stan Dow 22lb 12oz. Float Fish Farm Fishery, Saturday Open: 1 Vince Hull 67lb 10oz; 2 Harry Murphy 29lb 4oz; 3 Stan Dow 23lb. Webb’s AC, Float Fish Farm Fishery, Horseshoe Pool: 1 Marcus Webb 28lb 10oz; 2 Michael Pritchard 4lb 6oz; 3 John Brodie 4lb 5oz. Haddon Lodge: 1 Lucio Melillo Snr 18lb 6oz; 2 Lucio Melillo Jnr 15lb 9oz; 3 Martin Quelch 8lb 4oz. Ramsey AS, Old Nene, Ramsey St Mary’s: 1 Jim Broadbent 9lb 8oz; 2 Frank Bevilacqua 7lb 13oz; 3 Dave Chamberlin 4lb. Rookery Waters Winter Qualifying Open, Magpie Pool, Saturday: 1 Tom Cole 65lb 10oz; 2 Tony McGregor 60lb 8oz; 3 Ricky Ashwell 56lb 12oz. Tydd Gote, Midweek, North Level: 1 Andy Greenwood 8lb 11oz; 2 John Taylor 7lb 5oz; 3 John Young 5lb 6oz. Tydd Gote, Sunday, North Level: 1 Paul Dawden 3lb 1oz; 2 Andy Greenwood 2lb 6oz; 3 Darren Williams 1lb 4oz.